Now that is a saddle! American bikes have comfortable rider perches. Wide and thin. 5 inches of padding is not going to make up for a seat that is too narrow to start with, and making it 3 feet long is not going to make it any better either. John, is that you in the video? Good luck John. You will have an adventure and that's for sure! I'm planning/hoping to view the bikes and meet John on 9/13 in Bourbonais, IL. Maybe Sluggo will hook up when they get to Portland, OR. Anyone else near the route who might visit? Best of luck John and riders/bikes. No way in the world could I get time off to meet up with you, but you will be within 300 miles or so I guess. I think your going to like this trip, and I really hope you enjoy it here! Yes sir. Sorry for the slow reply. I will call tomorrow. If you read this a minute ago, you know I am a terrible thumb typer. Had some great phone conversatins with John over the last couple of nights. He's been busy as a three-legged dog with fleas keeping after his two charges. 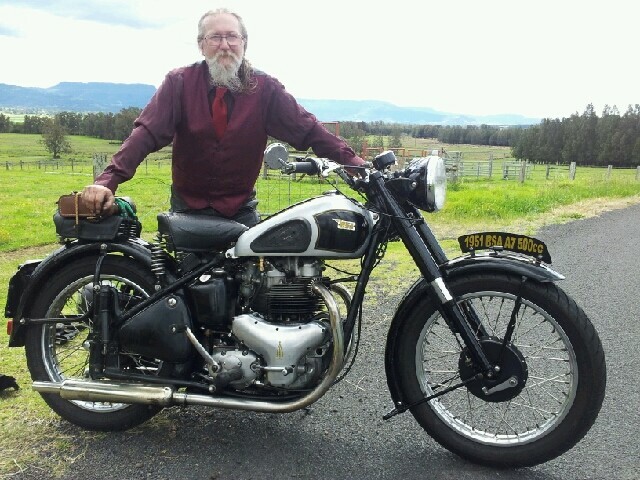 Today he reports a great running day for the Ariel, but Tom, the Harley rider, is ill. I suspect John is bedded down about 60 miles from me. Tomorrow I'm riding out 83 miles to see the bikes and riders at the scheduled stop closest to me. That will be my longest ride ever on a motorcycle. So it's my own personal Cannonball. Wouldn't do it if I didn't have a friend on a big Harley riding along. Turns out, I won't get to meet John in person. Support crews can't be on the same route with the bikes. If there's a breakdown, the bike is picked up by the official truck and carried to the next end point where the crew can work on it. Points are deducted accordingly. Also turns out, John's support route runs 30 - 40 miles south if where we will ride to get to the stop for the bikes. John told me an amusing fact about the race. The riders don't know where they're going on the back roads until they get there. The route is wound onto rollers that mount on the bars and the rider scrolls through the instructions ss he goes. I'll be sure to post some pictures, hopefully not of my bike broken down. Met a gent with an A10 in the works. Pointed at the web address on my chest and asked him to join-up, so expect.to see him here soon.